PITLOCHRY, THE FESTIVAL THEATRE, Sunday 6th July. TUNBRIDGE WELLS, TRINITY ARTS CENTRE, Friday 12th September. BATH, CHAPEL ARTS CENTRE, Saturday 4th October. IVY BRIDGE, THE WATERMARK, Tuesday 7th October. 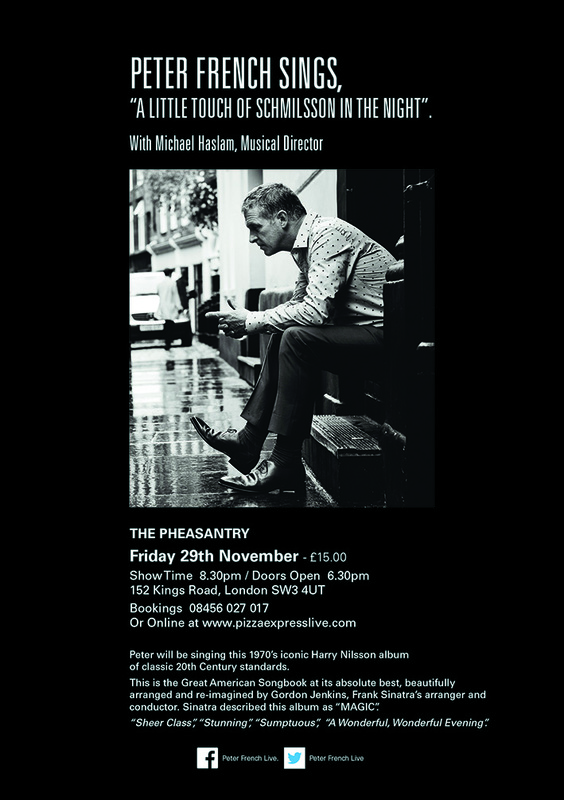 LONDON, THE PHEASANTRY, Friday 28th November. INVERNESS, EDEN COURT THEATRE, Friday 6th March. DIDCOT, CORNERSTONE, Saturday 28th March. HORSHAM, THE CAPITOL, Friday 17th April. 2013. A new show. PETER FRENCH SINGS HARRY NILSSON’S “A LITTLE TOUCH OF SCHMILSSON IN THE NIGHT”. This is a long held dream project that I finally brought to fruition. This is Harry Nilsson’s iconic 1973 album of classic twentieth century standards, beautifully arranged and re-imagined by Gordon Jenkins, Frank Sinatra’s arranger and conductor. Michael Haslam, my new Musical Director, transcribed all the orchestrations from the album for piano and we created something very special. 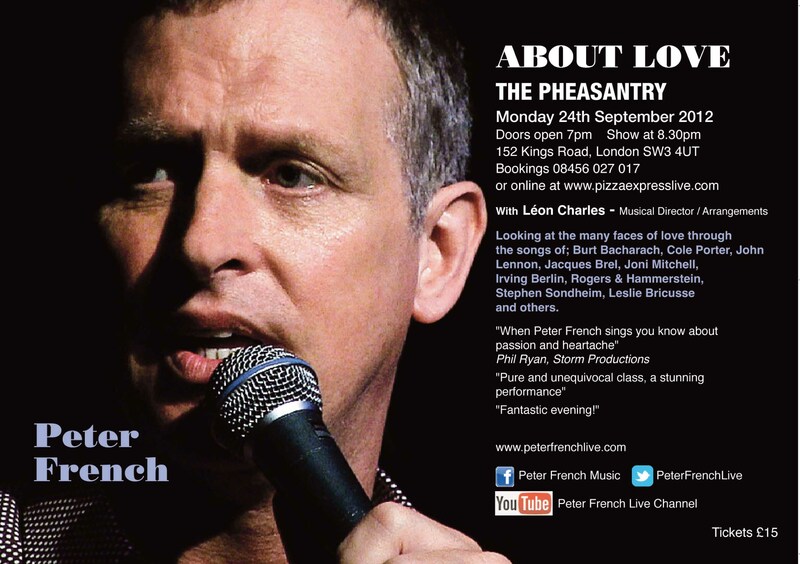 This show had its World Premiere in June 2013 at The Pheasantry, London and following its success we returned there in the Autumn to perform it again. We are about to tour it throughout the UK in 2014, starting at Dundee Rep Theatre on Sunday 4th May. 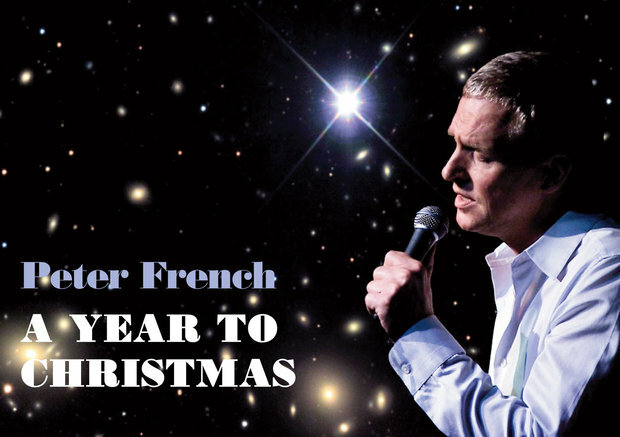 I had always wanted to do some kind of Christmas Concert, and here I created a narrative about a year in the life of someone, from one Christmas to the next, exploring life, love and work through the seasons, with anecdotes along the way. This was another wonderful project to work on with Leon Charles as my Musical Director, and was wonderfully received. 2012 saw me take a new direction completely. Instead of working with the trios, as I had done in all my previous shows, I decided I wanted to experience something more intimate in performance terms. I met Leon Charles, who was to become my Musical Director and arranger. I went back to my roots and created another concept show. This time the theme was ABOUT LOVE. I looked at the many faces of love, from innocence, through the ups and downs of romance and relationships to an older, perhaps wiser kind of mature love. This was such a great show to devise. I absolutely loved it. I loved choosing the songs and playing around with them until I found the ones that would fit the narrative perfectly. 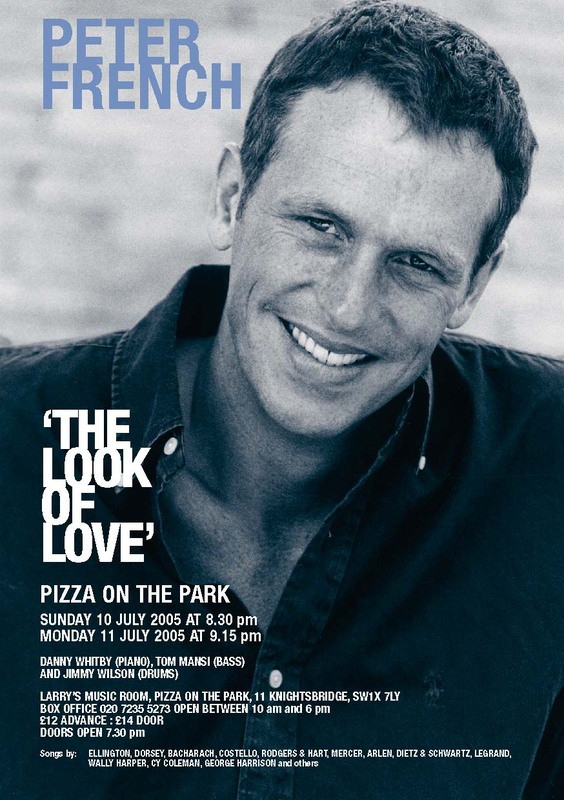 I was also able to choose songs that I love and had had in mind for this project for a long time, songs by writers such as Stephen Sondheim, Joni Mitchell, Burt Bacharach and a new wonderful singer songwriter called Tom Baxter. Working with Leon was a pleasure and we performed this a few times in London at the Pheasantry, before taking it to Dundee Rep Theatre. It is a show that I would certainly like to revisit as it was so well received and a joy to do. 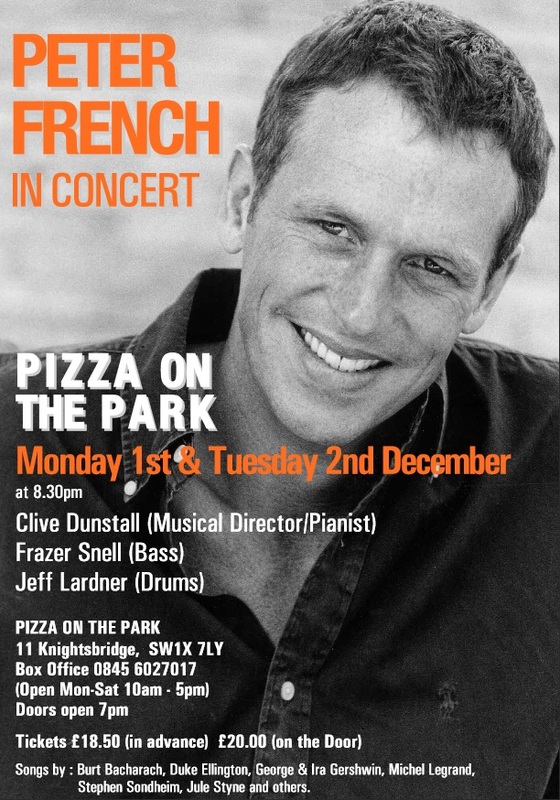 In 2008 I had the pleasure to work with Clive Dunstall as my Musical Director and Pianist, Frazer Snell (Bass) and Jeff Lardner (Drums). This was an opportunity for me to explore the material of one of my favourite singers, Tony Bennett. 2006 marked a departure from the concept formula, as I moved in a new direction. 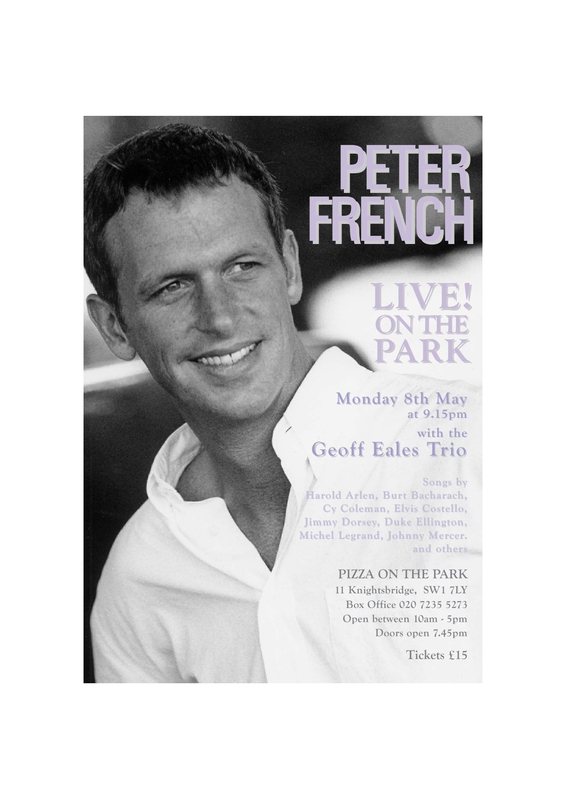 I was very privileged to work with two very well known jazz trios, firstly The Geoff Eales Trio and then The Brian Dee trio. This was an invaluable experience for me. Whilst I am not a jazz singer I really enjoyed working with Geoff and then Brian, both of whom not only taught me a lot but who were also so supportive of what I was attempting to do. These were lively evenings and very uplifting experiences that I will always treasure. This was the second foray into concept shows and again a huge favourite of mine. Looking at love and relationships from different angles with, of course, the title song being by Burt Bacharach and Hal David. 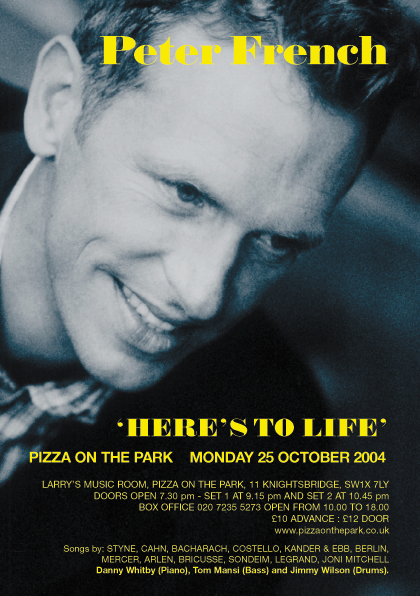 This is the flyer for my very first concert, HERE’S TO LIFE, at London’s famous Pizza On The Park. I couldn’t have started my career off in a better place, London’s foremost Cabaret venue at the time.This was also the first of my concept shows, whereby I would pick a theme for my concerts and then choose specific songs that would tell the story. Here, as the title suggests, this show looked at life, as we all live it, from love to relationships, and youth to older years. I loved this show and the songs I selected, quite an eclectic mix, from theatre songs to contemporary songs, a formula I have continued to use to this day. I like to take an audience on a journey and this one was the start of my own journey as a singer. This show was a huge success and set me on my way.